As you probably noticed, the UNPAN Online Training Centre was recently upgraded. Now, in order to receive the digital certificate, we require a minimum score of 60% in the first attempt of the assessment (the answers are shown after the 1st try, so for this reason we do not consider the subsequent attempts). If you fail in the first attempt, don’t worry: you will be able to retake the test after two months. Printed certificates will also be issued. 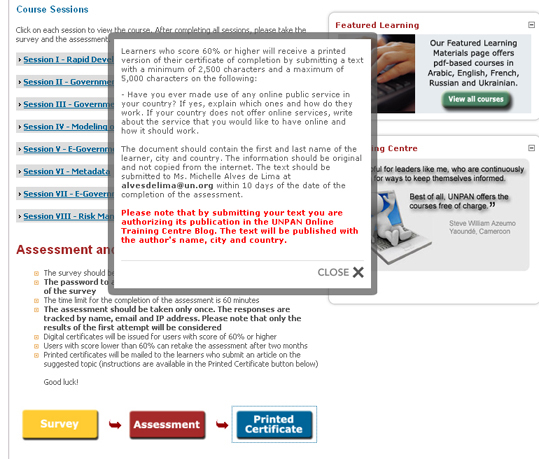 For that, users who successfully complete a course are asked to submit a text on a suggested topic (see example below). The submitted texts that meet our requests will be published in this blog, so other users can read and learn with your experiences. The blog should also be used as means of contact between you and the UNPAN Online Training Centre team, so if you have any doubt related to course content or access, certificate, suggestion, or other, please do not hesitate to post your comment. You are currently browsing the archives for the Gestión Presupuestaria Basada en Resultados category.